New kid on the Honda BSB block is Spaniard, Xavi Fores, who has joined the Louth-based factory team alongside relative newcomer, Andrew Irwin. The Northern Irishman is fresh from his ¾ of a season with PBM’s twin cylinder Ducati having replaced the six-time champion, Shane Byrne, last season. Xavi, you’re a new face to the BSB paddock and a new face of course to the Honda Racing team but tell us about the process of becoming a Honda rider? Well, first of all, I’m so excited to be a part of the British Superbike Championship. It was since a long time ago, when I was in Germany, I have been trying to get involved with this championship because it I think it is the best national championship in the world, so I was so looking forward to be here. Since world superbike, I was in a little bit of trouble to fund a good bike to continue there. It was always with a clear idea to be on factory team, or otherwise to try and fund another way. So, I was in contact with Chris Pike over winter and he brings me the chance to meet Havier (Beltran, Team Manager - Honda Racing) and the team, and we meet in Italy for the first time and it was quite easy to understand between us, and finally I’m here and I’m happy to be here in this project. Have you followed the BSB series in your career? I think most of the riders want to be involved with British Superbike at least one time in life so for me it will be a big challenge, but I will try to enjoy it and do my best like always. What do you think the biggest challenges are for your inaugural season? Well, it’s quite different because my bike last year was two cylinders and this is four cylinders after six years. No electronics, no wheelie control, no launch control and most of the tracks are new for me, but this is what I like. I like to do new challenges and I like to discover new championships, so in the end I didn’t expect to arrive in a factory team but it’s quite important for me, it’s a challenge that I will try to enjoy as much as I can. For sure, it won’t be easy, because most of the tracks are completely different to the world championship. But, like I say always, it’s ‘game on’. How are you finding the bike so far? You’ve tested here at Monteblanco and Portimao, two very fast and long circuits, but what have you discovered? Quite impressed with the bike. Honestly, I expect from myself a little bit worst, coming from the two-cylinder bike, it was like going to school again. I was so impressed in Portimao because I had some information from my old bike, so it was impressive for me to understand how fast the bike was turning. Of course, I missed some electronics but it’s so much fun to ride without electronics and it’s something I’m enjoying a lot. Because you have to be also clever to save the tyres and not do any mistakes, so it’s quite like old school riding and I like it. You’ve hit the ground running and have been near the top of the time sheets in the official test, you must be happy with the performance of the bike, yourself and the team? Yes, of course. I’m really, really happy with the performance with the job we’ve done. We were so focussed to test many things with the bike. I need to understand the bike and I need to understand all the parts that we can change during a weekend. And we changed everything on the bike and in the end we found a good set-up on the bike to start the championship, which I think is quite an impressive set-up for the Silverstone race. And which circuits in the calendar are you most looking forward to discovering? Well for sure the most famous track for us from Spain is Cadwell because of the jump. I have to say that I’m really excited to ride there. Being so close to our workshop I’m looking forward to going there and try to ride, even if it’s in the car to understand the layout! But there are a lot of circuits with a lot of history and I feel really proud to be part of the championship and to be able to ride on these kind of circuits. I will try to do my best and stay in front. There are a lot of new faces in BSB this year but who do you think will be your main challengers? Well, what is clear is that in BSB it always close racing. From what I have seen last year there are many different faces in front. You cannot say, no this one is not a competitor. All of them are very strong, they have shown that in Portimao and here at Monteblanco. We have to be careful with all of them because they have good bikes, good teams and a lot of experience with British tracks. It will be important to follow some of them during the weekend and learn how it works. 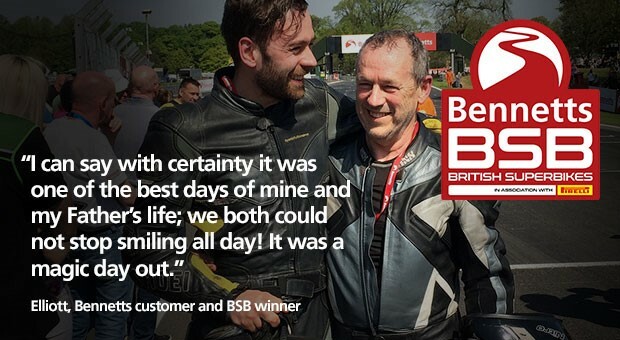 The 2019 Bennetts British Superbike championship gets underway on 19-21 April at Silverstone.